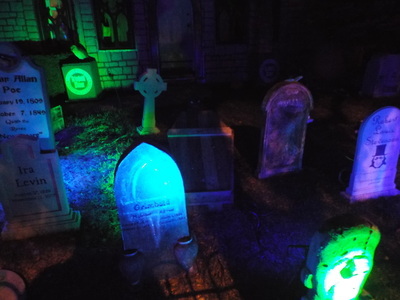 Grimbold Manor is a yard display with a unique spin. 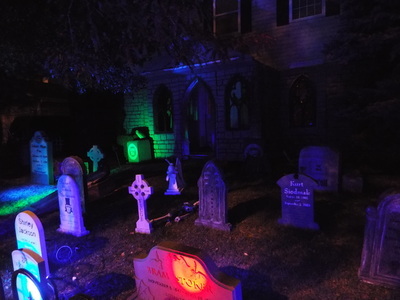 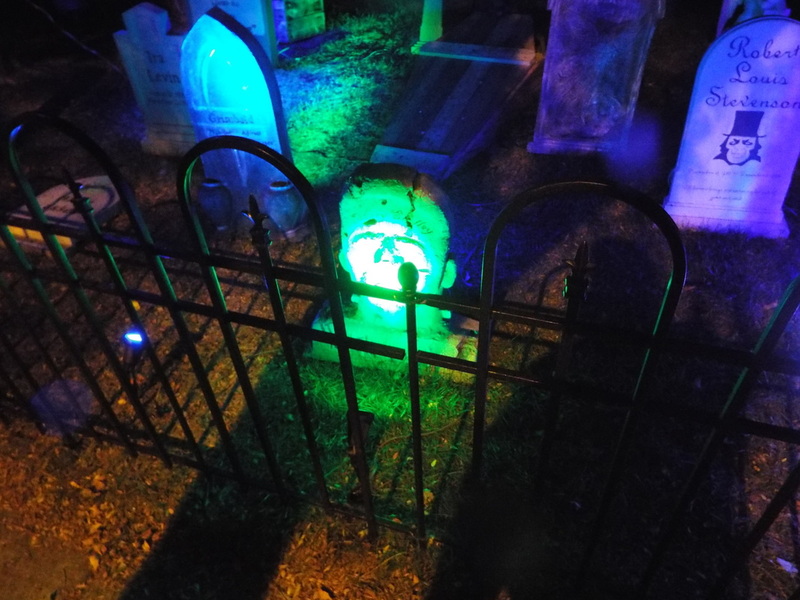 2012 was the first year for this setup, and primarily featured a cemetery setting with various tombstones dedicated to horror authors. 2013 saw an expansion of this concept, and featured not only the cemetery, but also a giant facade on the front porch that made the house look like an old, dilapidated manor. 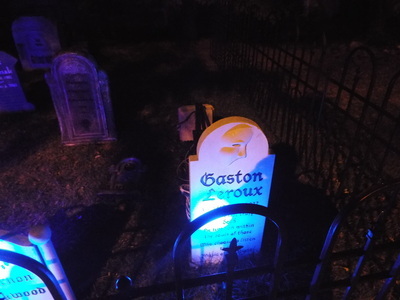 The main portion of the display, as mentioned, consists of various tombstones. 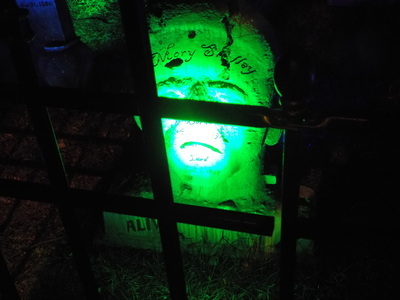 Unlike most Halloween displays, however, these tombstones all feature names of famous horror authors, both famous and more obscure, including such luminaries as Edgar Allen Poe and H.P. Lovecraft. 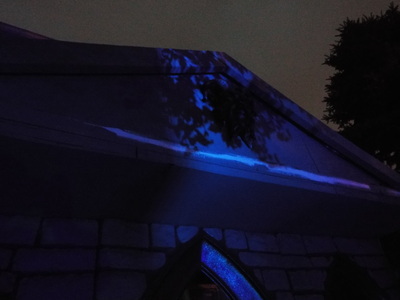 Each tombstone is unique in design and lighting. 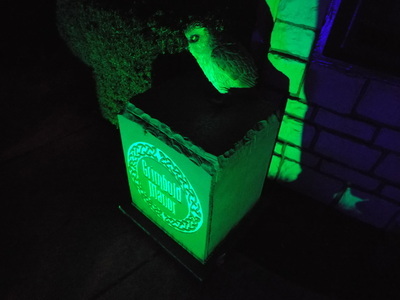 Some highlights include a tombstone for Dracula author Bram Stoker that is bathed in an eerie red light and a spotlight representing the full moon, and a very unique tombstone for Mary Shelley that is shaped like the head of the Frankenstein monster and bathed in green light. 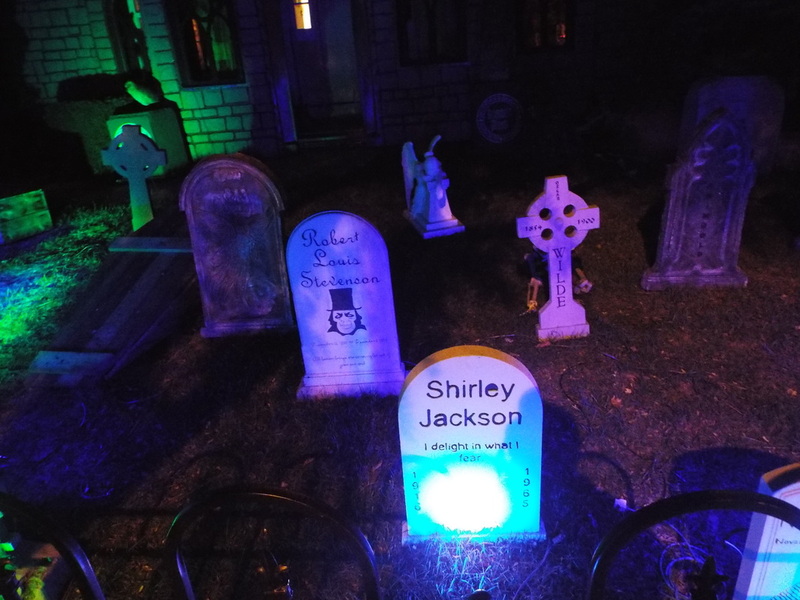 It's a lot of fun just looking at each tombstone and figuring out how the shape or lighting fits in with the author represented. 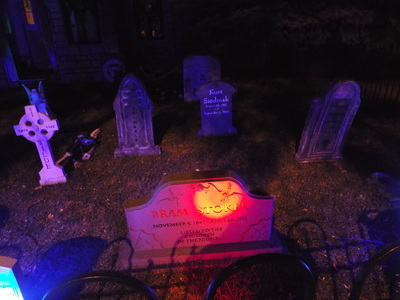 Aside from the tombstones, the new feature for this year is the manor facade. 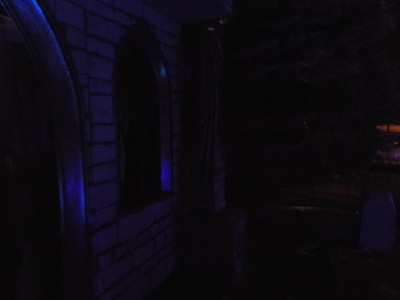 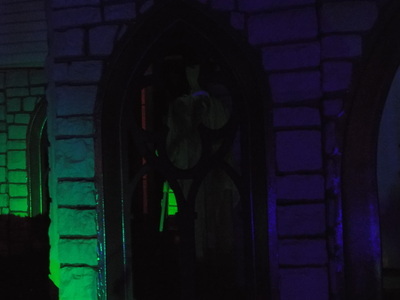 From the street, the front porch really does look like an abandoned manor of some kind, complete with stone pillars, gothic-styled stained glass windows, and even two large, deathlike figures on plinths that guard each side of the maIn entrance. On the evening we visited, it was cold and rainy, and the street was relatively deserted, adding to the creepy atmosphere. As we took photos and video, it really did seem as though we were trespassing somewhere were we didn't belong. 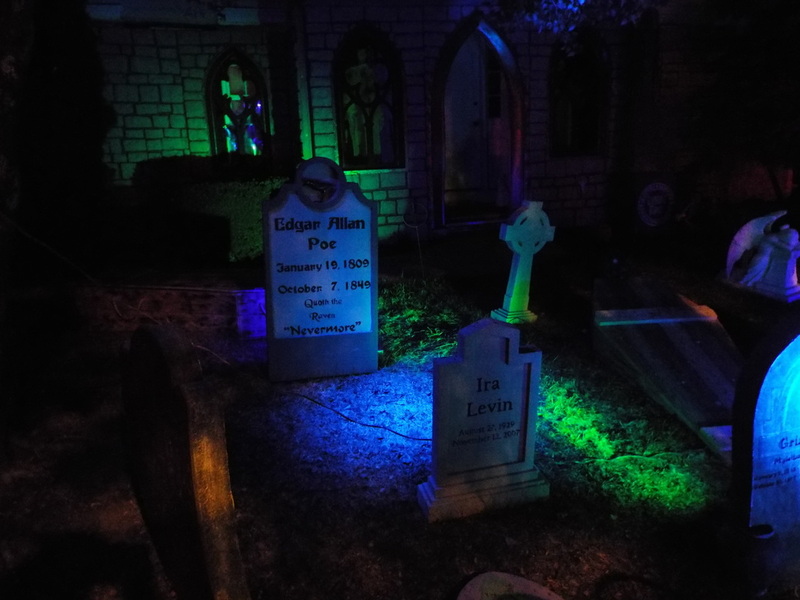 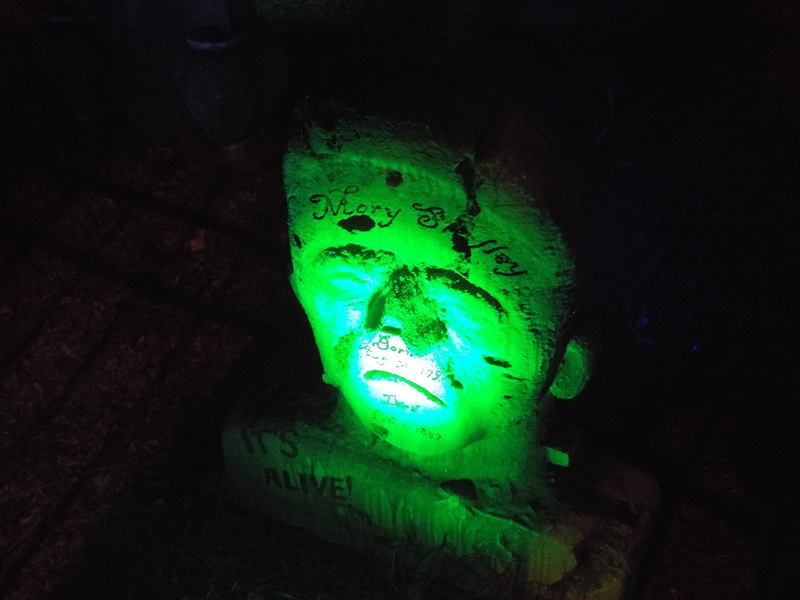 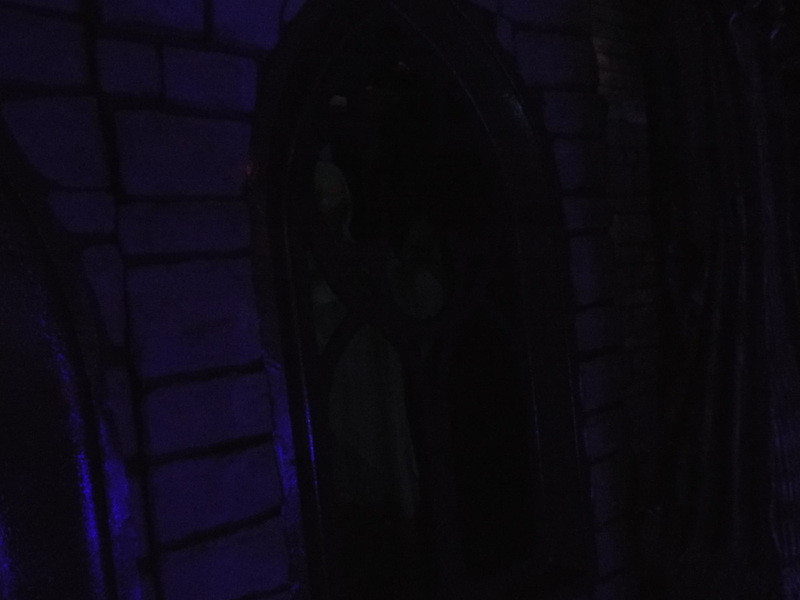 Special mention must be made of the lighting which not only gave the tombstones an eerie glow, but also set the creepy tone for the entire display. 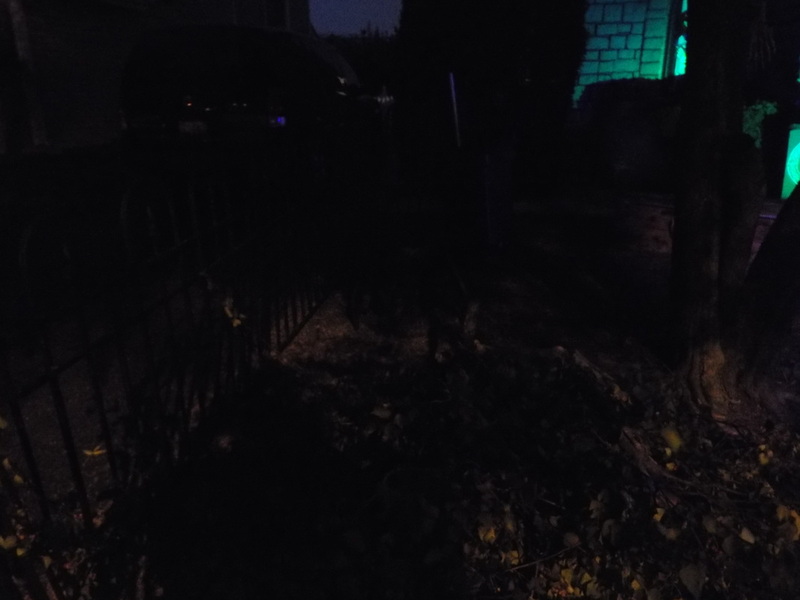 It was quietly effective. For those looking for a display that evokes images of haunted cemeteries, stormy nights, and eerie mansions on hilltops, look no further than Grimbold Manor!